We manufacture a wide range of Spring Mountings that are applicable in various industries and are appreciated for their excellent performance and durability. 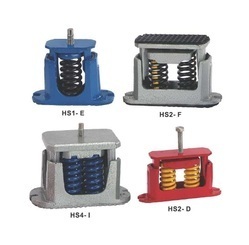 Fabricated using qualitative raw material, these Spring Mountings (anti vibration mounts) are offered at competitive prices. This unique range of Open Spring Mountings use integral rubber end fixing of the springs which set them apart from all other designs. 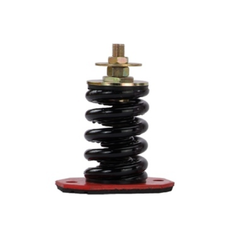 Loose springs and plates are now history and high frequency noise attenuation is provided regardless of whether a rubber seating pad isused or not. The OS Mountings are widely used to isolate vibration from every conceivable type of rotating and reciprocating machine. Where control of transient motion is required Open Spring Mounting can be used in conjuctionwith our Viscous Dampers Type SFD. Unique expanding rubber end fixing of springs(Patent applied for) which also provides high-frequency attenuation. Nominal 20, 25 & 50 mm deflection colour coded springs with 50% overload capacity. 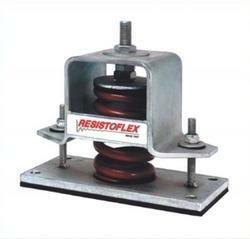 Can be bolted to supporting structure or freestanding on 6mm thick ribbed rubber pad. Fully height adjustable (OS25 & 50). No snubbing gives maximum efficiency. Pre Compressed Spring Mountings Damper is very low frequency and very high Viscous Damping Units fitted with a pre-compression device to facilitate adjustment at the site and easy installation/removal. The Isolator can be pre-compressed to its loaded height before installation using Jacks if required and held in precompression by the Tie Bars. Once the equipment is installed, pre-compression is released by loosening the Tie-Bars. Top and/or Bottom Friction pads for obviating the need of anchoring (bolting). Also available for bolting to the floor and/or supported equipment. Housed Spring Mountings consist of high deflection, Colour coded Steel springs assembled into telescoping cast housings separated by Neoprene Rubbers Inserts complete with built-in levelling bolt & thick Neoprene acoustical friction pad to eliminate bolting down. Rubber inserts isolate sound waves generated in springs, limit movement during start-up & shut-down & provide minimum damping in all directions to allow springs to function independently. Ideally suited for high horizontal thrust applications & low-frequency vibration problems. Internal Levelling (Suffix: I) Are Used When External Setting Is Not Possible. Mounting Is Aligned With Equipment Mounting Hole & Levelled By An Internal Bolt. Free Standing (Suffix: F) Has A Non-Skid Friction Rubber Pad Cold Bonded To Top Surface & An Internal Levelling Bolt. Damped Mountings (Suffix : D) All Versions Also Available With Built-In Adjustable Dampers. Damping Is Varied By Altering The Pressure On The Rubber Insert By Adjusting The Dampening Bolt. Tightening The Dampers Reduces Vertical Movement, Limits Bounce, Controls Side Motion & Rock. Wear Is Negligible As Damping Is Provided By The Viscous Distortion Of The Neoprene Inserts Rather Than By Friction. 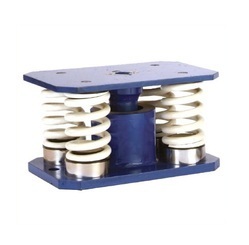 Spring Mountings with Damper is individually designed and analyzed to ensure that the correct spring stiffnesses, system damping and masses are provided to permit proper operation of the mounted equipment. A unique range of Enclosed Spring Mountings designed primarily for Building services applications where the control of low-frequency vibration & noise emanating from the mechanical plant is of paramount importance. The benefits of a combined rubber & steel housing for the spring are ideal to establish the ES & ECS mountings as industry standards by specifiers, equipment manufacturers & mechanical services installers. Isolation of Sensitive Equipment etc. 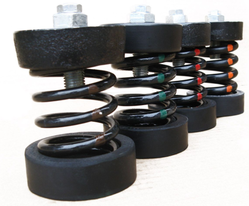 We offer Double Spring with Viscous Damper to suppress vibrations. 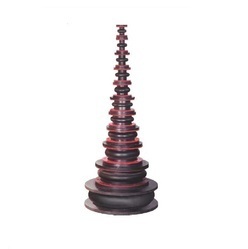 Manufactures form quality raw material, these are available at competitive prices. We provide high-quality Spring Mounting for multiple uses from light loading too heavy loading. We have a range that can cater to 10 kgs per mount to over about 5200 kgs per mount. We supply these mountings to various OEM's and HVAC contractors since the past 25 years and are considered their trusted house for quality products. 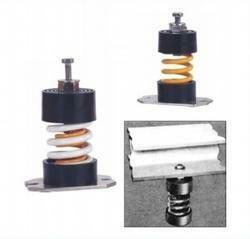 Spring Damper Mountings System creates large vibration forces which require isolation from the surrounding building structure. Large forces or doubtful machine stabilitymay require the use of an inertia block ofsteel or concrete to provide low dynamic amplitude on the machine whilst providinga stable and stiff base supported by steel springs and dampers. Where system resonances may be excited to unacceptable amplitude due to the varying speed of the machine or transientconditions, damping must be incorporated. The Open Restrained Spring Mounting has been designed specifically for applications where transmission of low frequency machinery vibration to a building structure must be reduced to avoid physical damage or annoyance to the occupants. Vertical and lateral restraint is provided to control movement of the mounted equipment when subjected to external forces. This could otherwise be excessive due to the low stiffness springs required to provide isolation of low frequency vibration. Equipment located at roof level can be successfully mounted on the ORS units as any movement caused by high wind loads will be limited. Cooling Towers and chillers which contain large volumes of liquid will benefit from installation on ORS mountings because during "draining down" upward movement is restricted thus avoiding damage to pipe work and electrical connections. High strength all steel construction. Colour coded helical steel springs with nominal deflections of 25mm and 50mmand up to 50% overload capacity. Vertical and lateral restraints have rubber inserts to avoid any metallic contact and adequate radial clearance ensures isolation efficiency is not impaired. Spring located using rubber sleeved pegs and seated on a rubber washer to reduce high frequency transmission. Working height and vertical limiting stops are fully adjustable. 6 mm thick cross ribbed rubber seating pad supplied as standard. The all-purpose heavy-duty Cup Spring Mountings for high-efficiency Isolation of low-frequency vibrations. Used directly under most HVAC types of equipment or construction with structural steel bases or concrete inertial blocks for reducing vibration amplitudes. Free standing-bottom base cup with non-skid surface eliminates the need for bolting down the isolator (cs). 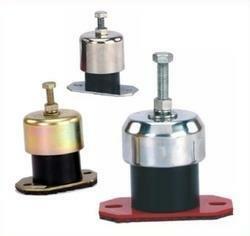 where essential for bolting down, mountings are available with the base plate having slotted holes. while ordering use suffix-b. Built-in levelling device furnished with locking cap screw and washer in the top cup for attachment to equipment. Weld-less construction - spring coils are not welded to steel plates. mounts are supplied in fully assembled condition. Low and safe operating stresses for long life-minimum additional travel to solid equal to 50% of rated deflection to accommodate weight distribution errors-springs will not the exceed-elastic limit. Laterally stable without housing, snubber guides. 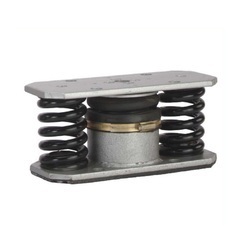 Acoustical rubber cups with steel reinforcement and tight grip at top and bottom of spring for attenuation of high-frequency noise and for maintaining rigidity/alignment with spring ends. We are offering an excellent quality of Spring Mountings PSM and PSX. Where an inexpensive hanger element is required for effective vibration isolation. Colour coded spring for visual identification of load range. Heavy Duty stable steel spring. Bolt hole in base rubber isolated. Bonded acoustic rubber pad on base, type (PSX). Spring located by moulded rubber cup, type (PSM). Built in levelling bolt & locking cap screw supplied with type PSM. 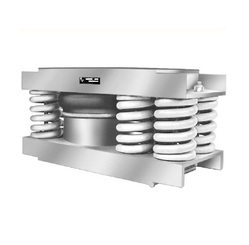 We are offering a wide range Open Spring Mountings Damper Unit. Each system is individually designed and analyzed to ensure that the correct spring stiffnesses, system damping and masses are provided to permit proper operation of the mounted equipment.